Jyn Erso to Return in a Star Wars Luke Skywalker Spin-Off? It is December and that means a couple of things. Yes, Christmas is just around the corner, but much more importantly to a great many people, Rogue One: A Star Wars Story has finally arrived in theaters. Many fans have already seen the movie and there are a lot of great things in it, one of which being Felicity Jones as Jyn Erso. What may be surprising is that she is contracted for a sequel to Star Wars: Rogue One. Be warned, there will be massive spoilers ahead for Star Wars: Rogue One, so read on at your own risk. That said, The Hollywood Reporter is claiming that Felicity Jones is actually under contract with Disney and Lucasfilm for a sequel to Rogue One: A Star Wars Story, which is downright baffling for anyone who has seen the movie, since Jyn Erso dies. Not ambiguously, mind you. She is straight-up, no questions about it dead. It was also recently all but confirmed by Lucasfilm President Kathleen Kennedy that the movie won't be getting a sequel. Anyone who has seen the movie knows that a sequel to Rogue One is a ridiculous notion for a lot of reasons, at least as it stands. Not only does pretty much every character introduced in the movie die, but the events of Rogue One: A Star Wars Story lead directly into the events of Star Wars: A New Hope. So that would essentially be the sequel to this first Star Wars spinoff. But this contract was done long before the movie was complete, so there could be a reason that Felicity Jones is contracted for a sequel. 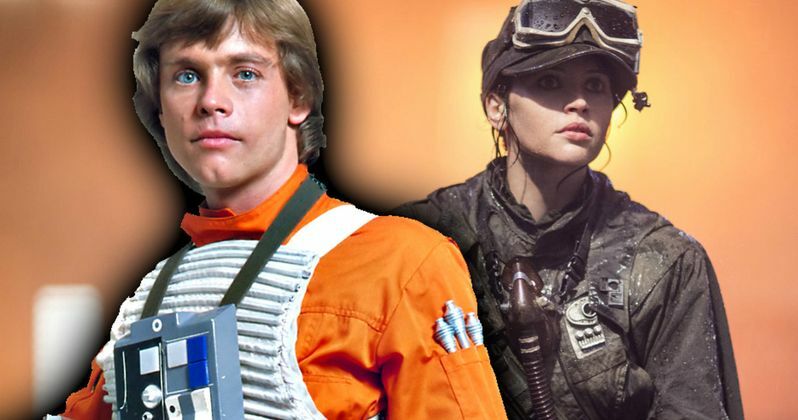 The report also notes that there are rumors of a young Luke Skywalker spinoff movie, which is where Jyn Erso may return, utilizing Felicity Jones' contract to the fullest. Reports surfaced several months ago that Rogue One had to undergo massive reshoots. The final product wound up being very solid, according to the opinions of both fans and critics so far, so that seemed to be a good thing. However, it has been noted that a ton of shots that were used in the trailers didn't end up in the movie. Some of those shots make it clear the ending of the movie was changed an awful lot, so it seems possible that Jyn Erso made it out of the original version of the movie alive. If that were the case, it would make complete sense that Felicity Jones was locked down for another movie. Star Wars: Rogue One expands the mythology surrounding the events of Star Wars: A New Hope quite a bit and in a lot of ways enhances that story. That said, we never heard of Jyn Erso or any of these other Rebels who stole the plans for the Death Star. If they lived, wouldn't we have heard them at least mentioned at some point in the original trilogy? That in mind, it makes a lot of sense that director Gareth Edwards and the creative team decided to go the way they did with it. So even though Felicity Jones has the movie on her contract, don't expect to actually see a sequel to Rogue One: A Star Wars Story. Ever.